10% bonus for every solved nonogram! New nonogram released: Bide Rider (40 x 30, ), 27 parts. Apr 22, 2019All nonograms solved already? Try fresh new one: Time to eat breakfast (45 x 28, ), 10 parts. Apr 18, 2019Day without a logic puzzle? Maybe someday, but not today: Blonde Mermaid (45 x 20, ), 34 parts. Apr 15, 2019Today is a good day to release new nonogram: Rhino (40 x 30, ), 9 parts. Apr 11, 2019Today we came with this nonogram: Horse Cab (50 x 30, ), 36 parts. Apr 8, 2019Added new nonogram: Smiley Face (35 x 24, ), 9 parts, 2 colors. Apr 4, 2019The time for new nonogram is now. Check it out: Red card (45 x 30, ), 15 parts. Apr 1, 2019Are you looking for a good brain teaser? Try this nonogram: Snowman (40 x 30, ), 12 parts. Mar 28, 2019Do you like solving small parts? So Happy Birthday! (30 x 25, ) is just for you. Mar 28, 2019All nonograms solved already? Try fresh new one: Boy and girl in the rain (40 x 30, ), 26 parts. 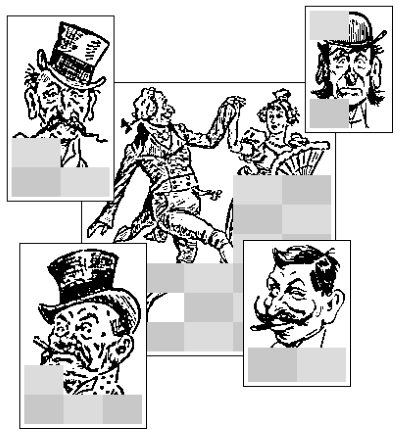 This site is dedicated to logic puzzles Nonograms (also known as Paint by Numbers or Griddlers). You can solve here nonograms and multi nonograms . Sign up - after free registration you can save your progress, use hints or challenge our Top Players . There are 859 pictures available consisting of 16,537 parts. Every nonogram has unique solution and is solvable by pure logic, no guessing needed.